Systematic and effective control of diameter and profile of wheelsets, back-to-back distance is an important component of monitoring of wheel wear arising in the process of wheelset operation. The requirements imposed to control instrumentation include high-accuracy, reliability and simplicity of operation. 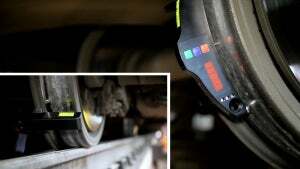 Continuity of wear monitoring process requires that measurement results be presented in digital form convenient for processing and storage in computer database allowing the possibility of data analysis and looking through wear history. All these requirements are satisfied by devices for control of geometric parameters of wheelsets manufactured by RIFTEK. High-measurement accuracy (±0.2mm) in a wide range of diameters (from 450mm to 1,300mm) is achieved owing to the use of absolute optical encoder with resolution of 0.5μm as a sensing device. Excellent reproducibility of measurement is achieved by using automatic averaging of results. Versatility: the caliper gauge can be used to measure any railway wheels with no necessity of removing wheelsets. Convenience of use is achieved owing to low weight (up to 0.5kg), digital indication of result and wireless data communication (Bluetooth) to computer. Information about wear over the entire profile is obtained by using non-contact laser scanning of the wheel surface. High-measurement accuracy (±0.1mm) and automatic calculation of required parameters of the wheel flange: height, thickness, slope and any other additional parameters specified by user. Information about distance between inner faces of wheels is obtained by non-contact laser rangefinder. Software is part of the devices supply package and makes it possible to follow wear history and generate any kinds of reports. A successful use of the devices on railways of more than 30 countries all over the world is proof of their excellent operational characteristics. For more information, please contact RIFTEK.